Are you searching for a distinctive bouquet, something out of the ordinary or a reminder of that fabulous holiday that you've just come back from? The striking blooms and lush foliage in these mixed flower arrangements capture the imagination with their distinctive flair and incredible architectural prowess. The tropical paradise you've been dreaming of need never be out of reach. A beautiful arrangement if 6 stems of white Asiatic lilies , 8 red roses & 7 red carnations arr..
Make their day glamorous and elegant with this bouquet of flowers featuring hearty shaped 3 green an..
2 Stems of Lavish Oriental Lilies, 8 Rose & 8 Gerbera Hand-tied in a cellophane paper suitable t..
Gloriously life like, this fabulous Twenty Mix Pink flowers arrangement basket it is paired with a c.. Check out this amazing gift pack containing a bunch of 15 Colorful exotic seasonal flowers with a ma..
Are you confused what to gift your friends and family on festivals? We at Gift My Emotions have perfect gift options for every occasion. Be it festivals, anniversaries, birthdays or special events like weddings and baby showers, you can trust GiftMyEmotions.com to provide you with best and latest gift ideas possible. Flowers have been the best gifting tradition since ages. Its popularity has not waned even today. They represent freshness, happiness and innocence. Their presence and fragrance brings magic in life. Gifting flowers on occasions conveys your compliments and best wishes to the hosts. At Gift My Emotions we have an impeccable collection of vivacious variety of flowers from colourful roses, radiant gerberas, royal orchids, refreshing lilies and enchanting carnations in lavish colours. 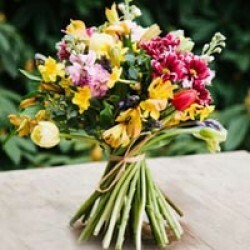 Send mixed flower bouquets to loved ones from varied arrangements and combinations of GiftMyEmotions.com. A bouquet of red roses, yellow roses, white carnations and yellow lilies with stems makes for a radiant gift on festivals. A vase arrangement of fresh orange carnations, white gerberas, purple orchids and yellow roses is a lively combo for enchanting your sweet heart. An all-white princely basket of white roses, white carnations, white gerberas and lilies will add glamour to your gift to your dear ones. We also have silver flowers for puja purpose on festivals and special occasions. Send heart shape arrangement of hundred red roses to woo your Valentine on Valentine’s Day and make it the most memorable day of her life. Send mother’s day flowers and gifts from exotic collection of Gift My Emotions to make your mother feel special and show how much you care for her. GiftMyEmotions.com commits to accurate flowers and gifts delivery in almost all cities of India and major destinations overseas like United Kingdom, Australia, Canada, United States, Malaysia, Singapore and United Arab Emirate. Now you can send flowers to Hyderabad also from Gift My Emotions with ease. Order cakes online from mouth watering delicious flavours like Black Forest, Pineapple, Strawberry and Chocolate truffle of GiftMyEmotions.com to treat your family and friends in India from any corner of the world. Gift hampers comprising of flowers paired with enticing cakes and sweets are the best options for gifting on festivals. Flowers with classy chocolates boxes and assorted dry fruits are best gifts for friendship day and weddings. Gift your sister personalized gifts with flowers and apparels to delight her and make her feel special on the auspicious day of raksha bandhan. At Gift My Emotions we commit best flowers and gifts delivery on exact time as required. Our excellent customer care support caters to all your needs and queries with great precision and helps you cruise through your shopping experience comfortably. We also have easy shopping options like free shipping and same day delivery. So go ahead and create an album of sweet memories to be cherished throughout life time by shopping at Gift My Emotions. We assure you that once you will shop with us, you will imperatively become a part of our loyal clientele.